Easy Shrimp Scampi Recipe and Grits – A simple and elegant seafood dish filled with buttery and garlicky flavor served over creamy perfect grits. 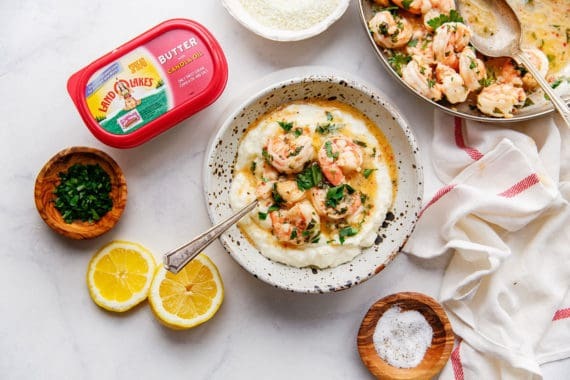 Disclosure: I partnered with Land O’Lakes for this Shrimp Scampi and Grits recipe post, but all opinions expressed here are my own. I am grateful for authentic partnerships like this. 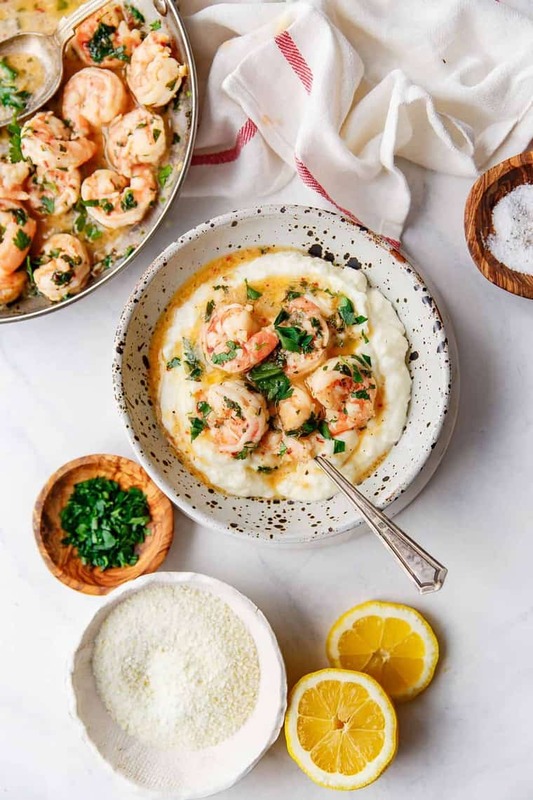 This recipe is a combo of two of my absolute favorite meals: Shrimp Scampi and Shrimp and Grits. When intertwined, the two are glorious and worth a dissertation of a post; however, I will keep my insane love for it as short as humanly possible. I first became addicted to an Easy Shrimp Scampi recipe in my early 20s. I used to make a super fast version of it that soon became my go-to for quick, delicious meals (when I could afford shrimp) in college. Once I graduated and got my first apartment and first real job where I could afford shrimp more regularly, I made it at least once a week. Shrimp Scampi is the gift that keeps on giving — the flavor is always a hit and it takes minimal time to make. 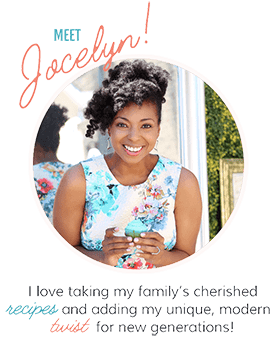 You can cook it right after a long day of work or on a weekend for something special. With my grits twist, you will adore this shrimp scampi recipe for brunch entertaining. 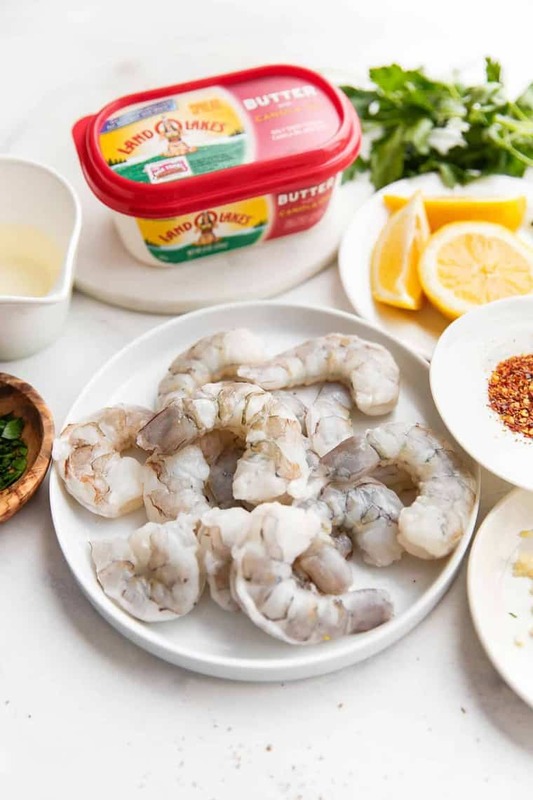 What makes this Easy Shrimp Scampi recipe so addictive is the buttery, garlicky goodness in every bite. The butter is incredibly important because the recipe begins with this magical ingredient. 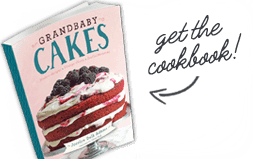 I used Land O Lakes® Butter with Canola Oil for this recipe because it is so versatile. 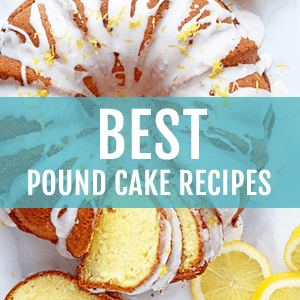 It only has three ingredients: sweet cream, canola oil and salt. You can literally taste the purity of it in the recipe. Because it contains both butter and oil, it is perfect for high heats where you want the taste of butter but you don’t want to worry about burning. You get the best of both worlds, and the flavor is amazing. 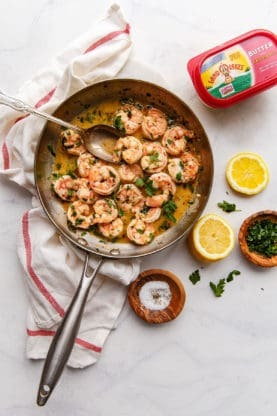 WHAT CAN I USE AS A SUBSTITUTE FOR WHITE WINE IN SHRIMP SCAMPI? I also added both minced garlic and garlic powder to double the punch, along with a little heat from some red pepper flakes. The rest of the ingredients are quite traditional – especially the wine and lemon juice combination. If you are forgoing wine, you can definitely use any broth of your choice as a substitute. Because I have literally made this dish for almost two decades, I have made it every possible way imaginable. I’ve served it over rice and pasta for years, but this grits twist is truly my favorite. 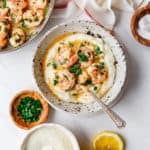 The combination of shrimp and grits have become so popular in the last decade of so, but I can tell you my love of grits goes back to my childhood. Grits are a Southerner’s (or those raised by Southerners) dream, and I was raised by Southerners. I’ve made so many pots of grits over the years that I should be given top grits guru status. In fact, I recently made a post on how to make the creamiest perfect pot of grits, which you must check out if you are new to the game. These grits are perfect, creamy, and most importantly, buttery. I add an entire stick of Land O Lakes® Unsalted Butter to the batch, and the final results are magical. These grits become the perfect bed to serve this Shrimp Scampi recipe over. The flavors melt into one another. After having Shrimp Scampi over grits, I doubt I will ever go back to anything else. 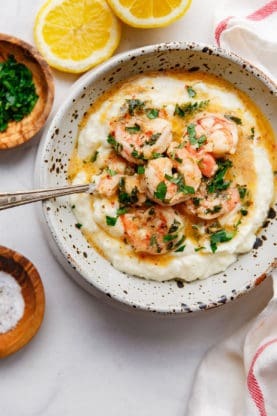 If you like this easy shrimp scampi recipe with grits, then you’ll love some of my other easy shrimp recipes. Easy Shrimp Scampi Recipe and Grits - A simple and elegant seafood dish filled with buttery and garlicky flavor served over creamy perfect grits. Add ¼ cup Land O Lakes® Butter with Canola Oil to a large skillet over medium high heat. 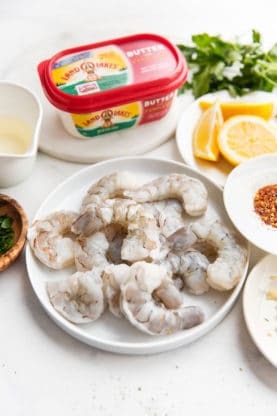 Once butter with canola oil melts, add shrimp. Sprinkle with salt and pepper to season and sauté for about 1 or 2 minutes on each side until they turn pink. Make sure not to overcook them since shrimp cook very quickly. Add minced garlic and cook for just about 30 seconds. Next pour in wine and lemon juice then season with red pepper flakes, 2 tablespoons of parsley and garlic powder. Stir together, lower heat to medium low and reduce sauce by about half. Turn off heat and swirl in butter. Top with parsley as garnish once plated over grits. Add grits to plate and serve shrimp and sauce over it. Sprinkle with parsley and serve. This I’m sure is a super tasty recipe, but I suppose I have to find lower saturated fat version, I have diabetes & high cholesterol. 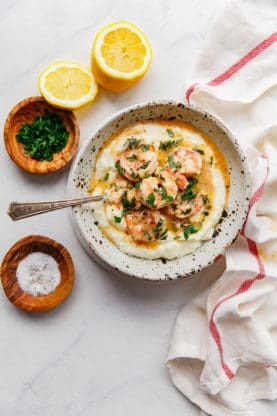 I will definitely be making these shrimp and grits. It sounds wonderful. Thanks so much! Super delish! This recipe looks almost too good to eat!! Thanks for sharing!!! 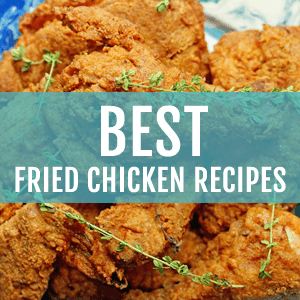 My grandsons love fish and grits, so this recipe was a winner . Said earlier that I wasn’t sure about the ”grits” never say never until you try it. I did try , plus my grandsons loved it. These are men aged from 16 to 42. Absolutely!!! Thank you so much! A true southern dish. I love this it is one of my favorite dishes to have when I am down south. 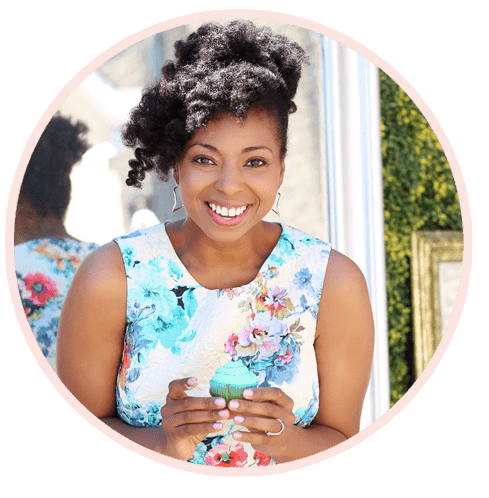 What an amazing recipe to try! Looks yummy! I love a good bowl of shrimp and grits! This looks Amazing! I am so ready to try this dish. This is gorgeous! And the pefect comfort food! This looks like pure comfort food to me! Looks delicious! My husband would go crazy for this! I definitely need to try it! What a tasty treat! I love shrimp AND grits!